This suit comprises a front-fastening jacket, buttoned to the neck, and a pair of trousers in matching material. Its main association is with communist China. 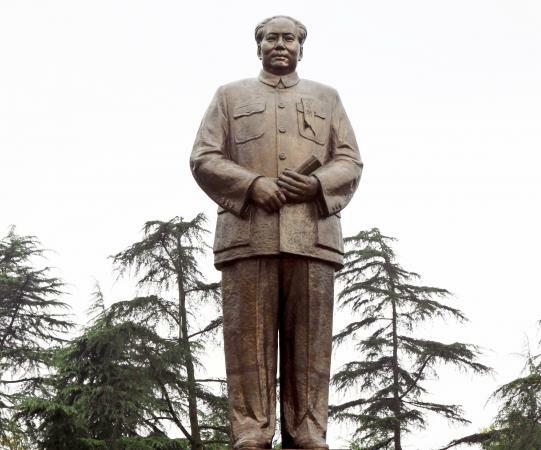 It is named in English after Mao Zedong (1893-1976), the leader of the People's Republic of China from 1949 to 1976. Its salient features are a high, turned-down collar that fits the neck closely, and four patch pockets, two large ones at waist level and two smaller ones on the breast. A classic Mao suit has expandable lower pockets, and both the top and bottom pockets close with a buttoned-down flap. The trousers have a waistband, with a fly-front fastening for men and a side fastening for women. The suit can be made from a variety of materials with cotton, polyester, or a mix of the two being the most usual. It is almost always blue, though within that spectrum the colors range from pale gray to dark blue-black. The suit is often teamed with a matching worker's cap. Mao suits can either be purchased offthe-rack or tailor-made. In the early years of the twentieth century, as an alternative to both the long gown and the western suit with collar and tie, several different styles, similar to the Mao suit but with a high-standing collar and no patch pockets, began to be worn by Chinese men. These have been viewed as precursors of the Mao suit and are called student suits because they were first adopted in Japan by Chinese studying there. The student suit, which had derived from European, probably Prussian, military dress, became linked with those urging political and economic reform for China. Another famous Chinese leader, Sun Yat-sen (1866-1925), revered by Chinese the world over as the "Father of the Nation" for his part in creating a Chinese Republic in 1911, is credited with making adaptations to the student suit, although it still did not look like the Mao suit we know today. It was in the 1920s that Sun himself appeared in what we now perceive as a fully fledged version of the Mao suit with patch pockets. This followed on a more overt link with Soviet communist advisors, who also wore this type of suit. See also China: History of Dress; Politics and Fashion. Roberts, Claire, ed. Evolution and Revolution: Chinese Dress, 1700s-1900s. Sydney: Powerhouse Publishing, 1997.